Do you lose if you reveal your entire library? 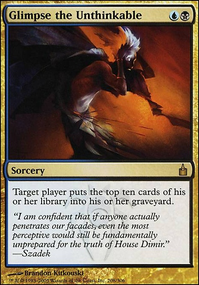 Each opponent reveals cards from the top of his or her library until he or she reveals X land cards, then puts all cards revealed in this way into his or her graveyard. X can't be 0. MelinsMagic very interesting take on mill - i like! 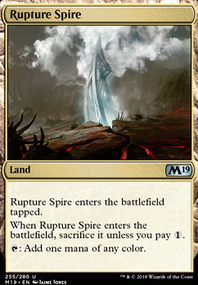 Feels like (because your deck is very trap focussed) that in some matchups you’re in trouble if you don’t pull the Field of Ruin . How’ve you found the games so far? My current mill-build only really runs Damnation as control, so it’d be intersting to hear how the more controlly version, whether you have issues with people out-racing you etc.?? FullmetalWes Mind Funeral is great but Mind Grind is terrible because it’s just too mana intensive. 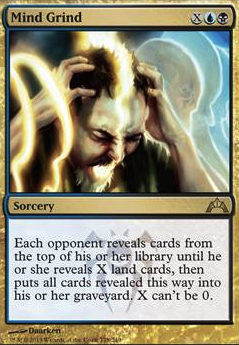 Your “combo” is also too unwieldy for modern, as mill can’t justifying running more than 1 Fraying Sanity (drawing a second is often a game-loss), and Traumatize is just too slow. Varloz can be a pretty good deck, even competitive with a certain combo, if you want to help him just improve that deck. Consuming Aberration , Fleet Swallower , Traumatize , Mind Grind , Journey to Eternity Flip, Villainous Wealth . Dimir is kind of an oddball. Scarab God is by far one of the best choices for dimir commanders. You don't even need to play that many zombies to make him good. 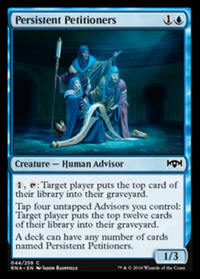 You could also play Lazav, Dimir Mastermind and use mill not as a win condition, but as a way to activate your commander. 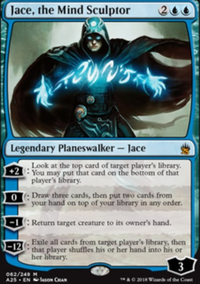 He also makes counterspells and creature removal way more relevant, since he can become anything you counter or kill. If you're dead set on mill, Phenax, God of Deception might be your strongest bet. 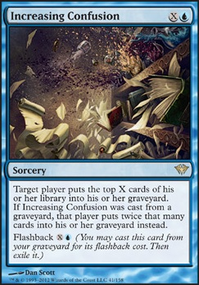 You can run Eater of the Dead to go infinite, and as long as you're using global mill effects like Psychic Corrosion , Mind Grind , Consuming Aberration and wheels like Windfall and Whispering Madness can go well with your high-toughness creatures (such as the oft-maligned and very inexpensive Tree of Perdition ). I'm afraid mill decks will never be "competitive" but they are absolutely capable of winning. also Mind Grind is bad, it costs too much, instead run Mesmeric Orb . instead of Fountain of Renewal you should use Crypt Incursion . and lastly you gotta use Surgical Extraction I know it just went up, but your mill, I'd say its almost the most necessary card. 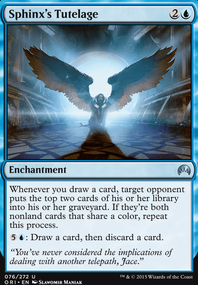 Stasis is paired with the return permanant creatures. The purpose is to attack all players equally.